A Case of the Runs: Standing at my Desk? I randomly received the infographic below via e-mail. I have blogged about being active while working before, though I no longer work here and things are too crazy at my current job to follow my stretch reminders that I used to set at my other old workplace. Nowadays, I am a little less sedentary at my desk than I used to be, mostly because I'm running off to pump (hopefully not for that much longer, though! ), go to the gym, get water, etc. I used to have days (pre-baby) when I would literally not move (or thereabouts) at my desk from 8-4 straight. I figured, I got my morning workout in... so I'm good! Sure, this is a promotion for a standing desk company, but I'm sure there's a lot of truth to this. Now, if standing at my desk for half of the workday could get me even close to this 11-marathon per year figure, I could get in better shape. I have a co-worker who kind of made her desk a makeshift standing office by putting her laptop up high. Maybe I'll come up with something?? I work in a very analytical position, so I'd have to be good at spreadsheet-ing it while standing. The risks have to do with cardiovascular damage, so standing is certainly *healthier* for you. 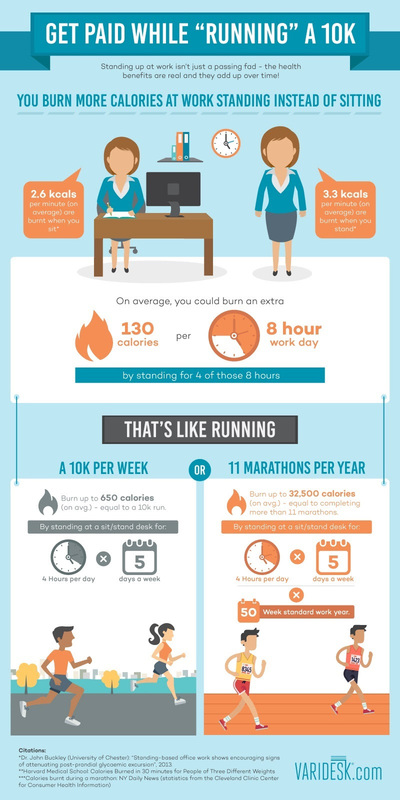 But, I do question a bit whether standing vs. sitting can really be said to make you *fitter* (since just burning more calories full-stop doesn't necessarily get you in better shape). Thanks for the comment! Having a healthier cardiovascular system would probably contribute to my overall fitness?? By "getting in better shape," I mean being able to do the things I would like to do (like when I had more time for cardio before).